Rotek Series 1000 turntable slewing bearings are typically available from stock. Series 1000 slewing bearings are constructed with chrome alloy steel balls with no spacers and steel rings with unhardened raceways. This series provides a cost effective solution for applications requiring low-speed, bi-directional rotation of light loads. The standard series turntables are the result of many years' design and manufacturing experience in the field of trailer steering systems for road truck trailers, positively steered semi-trailers, fifth wheel couplings, heavy goods vehicles and special vehicles. Rotek turntables are produced to exacting standards and are designed to meet high performance requirements. 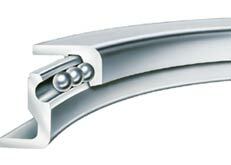 Raceway Diameters: 12" to 42"